How does illness fit into a cultural symbology? In her book-length essay AIDS and Its Metaphors, Susan Sontag analyzes AIDS as one of a few “metaphorized illnesses that haunt the collective imagination.” As Sontag acknowledges, “one cannot think without metaphors”; however, she insists, “that does not mean there aren’t some metaphors we might well abstain from or try to retire.” Thus, Sontag’s work in this essay and its predecessor — Illness as Metaphor, on cancer — is purgative. She seeks to clear away the metaphors surrounding these illnesses in order to confront them as brute facts, freed from symbolic baggage. Such work is vital, not only for theoretical reasons — to think most clearly and freely, we ought to scrutinize the metaphors in which we trap ourselves, or in which others trap us — but also for urgent practical reasons. Reflecting on her purpose in examining cancer, Sontag writes with striking bluntness, “The metaphors and myths, I was convinced, kill . . . I hoped to persuade terrified people who were ill to consult doctors.” And the metaphorization of AIDS has been, as Sontag details, even more lethal and intentional as an instrument of the “ideological mobilization against deviance.” The metaphorization of illnesses kills; Sontag, by critique, aims to save lives. 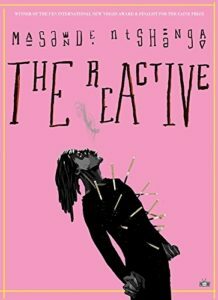 The Reactive, the first novel from South African writer Masande Ntshanga, poses a version of Sontag’s question about AIDS and its metaphors from a different angle. The novel follows three young South African people — Lindanathi, Cecilia, and Ruan — living in Cape Town in the early 2000s. Lindanathi, on whom the book centers, is HIV-positive, and the three make a living selling antiretroviral drugs under a regime that restricts their availability. In the novel, HIV and AIDS take on grand and far-reaching symbolic significance — a species of metaphorization — as is only sensible in the political climate in which the novel takes place and given Lindanathi’s personal predicament. However, Ntshanga does more than merely illustrate the way this illness, like all things, plays a role in human symbology. Rather, the novel creates a space in which the reader can experience this metaphorization as well as critique it; it thus allows us to engage in the tension between metaphorization’s necessity and its damage. Ntshanga accomplishes this and his many other artistic feats by elegantly intertwining the personal with the political. The Reactive’s two epigraphs, worlds apart in register but unified in the despair they suggest, situate the novel in two distinct but related traditions: the protest novel and the novel of fundamental human alienation. First is a quotation from former South African president Thabo Mbeki: “We need to look at the question that is posed, understandably I suppose: does HIV cause AIDS?” Ntshanga uses Mbeki’s tragically deluded statement to prepare us to read what follows in light of the desperate political situation of a government’s willful ambivalence over the fate of its people. Ntshanga thus opens the space of a protest novel, and though the content never turns didactically political, this spirit persists throughout the work. The second epigraph is taken from Kafka’s letters: “We are as forlorn as children lost in the woods.” The Reactive bears out the promise of these two well-chosen epigraphs. It lives at the convergence of these traditions: its content is essentially and necessarily political, while in form it centers on a single thoughtful, uneasy consciousness. That consciousness belongs to Lindanathi, whose name, he tells us, means “wait with us,” a signal of both his reticence to decisively act (wait) and his need for companions in his listlessness (with us). Before he reveals the name itself, he mentions that it’s one borrowed from a girl — a fact he repeats again and again, until the book’s final paragraph, evidence of his and the novel’s tortured and thoughtfully wrought relationship to constructions of masculinity. Lindanathi serves as a classic existentialist protagonist: perceptive, thoughtful, lyrical, troubled, and uncertain how to act. The novel finds him dealing or failing to deal with the event he confesses in the book’s first sentence. “Ten years ago,” he says, “I helped a handful of men take my little brother’s life.” Haunted by guilt, Lindanathi haunts his own life, which he drifts through, drugged and dazed. He understands himself as undead and refers to his HIV-positive status as a state of being between life and death — like a vampire, he feels the presence of a “seemingly mystical barrier from returning home”; he’s a denizen of the in-between. What will I remember about my friends? The good times, I suppose, even though they didn’t always appear good at the time. I’ll remember Ruan telling us that he’d made an evaluation of our personalities, and that he’d plotted them on a hundred-year time scale and concluded that, in the near future, it would become easier for the three of us to detect the defects carried by other people, their fears and deceits, and because of this, we would have a map to locate others like ourselves, who’d been marked in similar ways. I remember agreeing with him, that day, and maybe each of us had felt more hopeful than usual. Ruan, Cissie and I had been huffing paint thinner at Ruan’s place in Sea Point. Elaborating, Ruan said that after leaving school, he’d lost his natural ability to cultivate relationships with other human beings, but because of the two of us, he felt this being restored to him. But The Reactive is not merely a story of glue sniffing and philosophical speculation. At times the novel functions like a thriller (the first sentence sets up the question of Lindanathi’s involvement in his brother’s death, and the plot is triggered by a mysterious masked man who seeks to buy out this group of friends’ entire supply of antiretroviral drugs). Yet there is no blood-pumping climax, no shocking shoot-out. Each of the novel’s most dramatic elements ultimately collapses back into the mundane. In reference to a subdued therapy session, Lindanathi admits, “I guess this isn’t really dramatic.” This statement could stand as an expression of the novel’s artistic ethos. The masked man turns out to be “just one of the city’s many ciphers” — nothing special, just part of the structure of life. Occasional explosions of violence turn out to be dreams, relegating the dramatic to a shadow-region of the real. The novel’s action reaches its (anti-)climax in a series of revelations that shock the reader while exposing the characters as ultimately without agency in the anti-drama of their lives. The impossibility of controlling the fates of those he loves drives Lindanathi to conceptualize HIV as a curse he deserves, and this is what lines up so perfectly with Sontag’s analysis: “With AIDS,” she writes, “the shame is linked to an imputation of guilt” — the guilt, she goes on to explain, of being queer in America. Though his context is different from Sontag’s, Lindanathi puts the similar cultural coding of the virus to use. He is an HIV-positive person for whom HIV is operating, surely, as a metaphor. The reader is thus moved to think about the virus as woven into the symbology of a life in a way distinct from but related to Sontag’s critical work. But what Ntshanga can offer in The Reactive that Sontag cannot in her essays is a phenomenology of the afflicted. “Sometimes,” Lindanathi tells us, “I like to imagine I can hear my illness spinning inside my arteries, that it’s rinsing itself and thinning out.” For him, HIV is its signification, but it’s also a lived state, a physical event, the condition of his embodiment. It is not him, but it is his: “my sickness,” he calls it, and “my virus.” The leader of the therapy group they attend tells the group of HIV-positive attendees, “There’s no cure for HIV, but as you can see yourself, it’s a condition anyone can live with.” Half a century after Hannah Arendt’s book of the same name, the phrase the human condition is so pervasive that it’s hard not to read this statement as broadly applicable: just substitute mortality for HIV. And this reading does cohere with the novel’s quiet, hope-laced despair and the parallels it invokes between illness, drug use, life in modern Cape Town, and the general malaise of human existence. I thought about our country’s infection rate. I wondered if we’d been selected in particular for this trial. Perhaps HIV was a purge, I imagined, a brutal transition on the other side of which might lie a newer, stronger species, one resistant to a thousand more ailments and vital enough to survive all the trials that were still germinating in the future. We might, then, both acknowledge that Lindanathi’s (and Ntshanga’s) use of HIV as a metaphor is true to a human experience of the virus and also question the interpretive and socio-political consequences of this metaphorization. The Reactive is not only a beautiful novel, as fierce and formally innovative as it is lyrical and moving, but also a call to inhabit as well as to critique the symbolic structures of our world that can both empower and betray us. Nathan Goldman’s work appears in The Millions, The American Reader, Word Riot, DIAGRAM, Metazen, and elsewhere. Find him online at nathangoldman.wordpress.com and @nathangoldman.